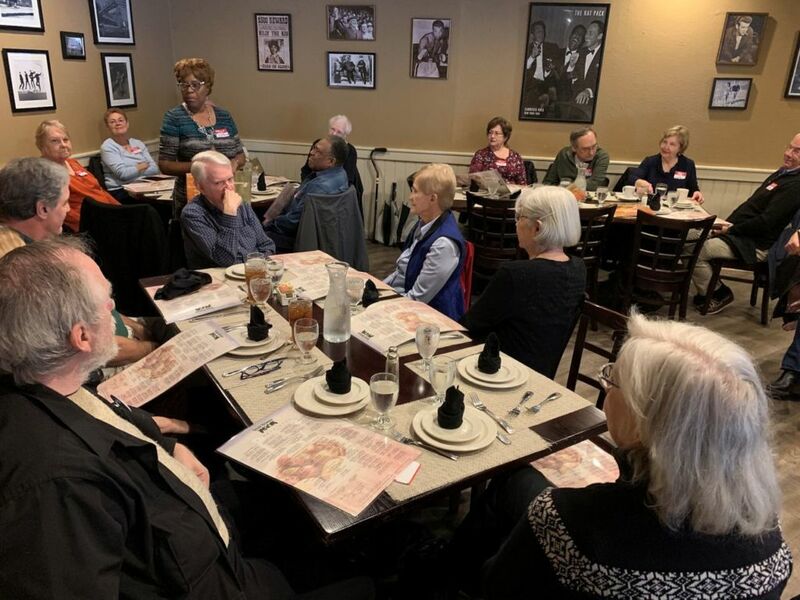 The club’s newly founded “YLs and Friends Net” members gathered at the Tuscany Restaurant recently for their first “Meet and Greet” so YLs and OMs could come together and meet each other in person. Joyce Carpenter KX4MK acts as net control during the Sunday evening net that begins at 8:00 p.m. on the local 146.76 repeater. Recent nets have lasted well beyond the formal portion with both YLs and visiting OMs having lively discussions of both technical and non-ham related topics. Jaylene Fields KN4KXK brought up the idea of a net dedicated to YLs at a Saturday breakfast get together and Joyce KX4MK, a graduate of our 2018 Technician licensing class and who currently holds an Extra Class license, did the prep work to contact local YL hams and invite them to participate. Cynthia Frank K4CEF acts as the group’s official “arm-twister” to bring folks together for both the net and the member’s first event. Dinner attendees totaled 21 and included YLs along with both ham and non-ham OMs. The club has made a concerted effort over the last year to increase the number of YL ham members with ladies now making up over 10% of the membership; two YLs have the Extra and one Advanced licenses currently with several studying for their Extras — watch out guys, better dust off those license manuals if you want to keep up! WAARC member Cynthia Frank K4CEF describes her efforts to insure YL club members are aware of the efforts to support the newly founded YLs and Friends Net and group.